Size: 10.7" x 8.5" x 2.5"
This TI-8230 took us by surprise! 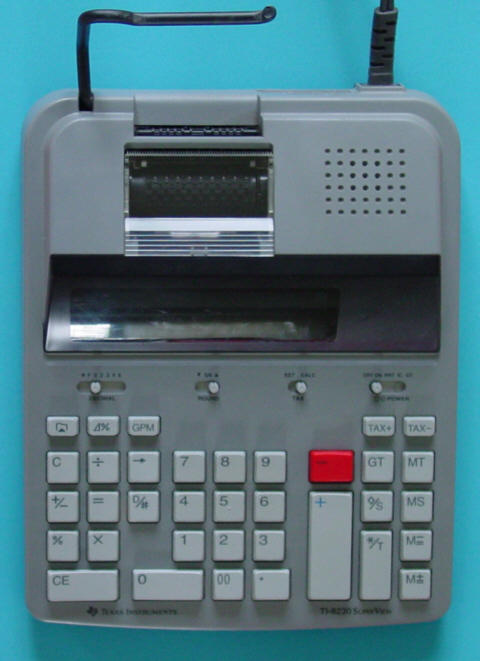 The label of the calculator clearly states: MADE IN U.S.A. and reminds us of the US-built campaign started in 1989 and leading to the TI-7000, TI-7100, TI-7140, TI-7200, TI-7300, TI-7400, TI-25 SOLAR. The UL-File number E153592 of the calculator is inactive and doesn't reveal the maufacturing plant. Don't miss the database of all known UL-File numbers found on Texas Instruments calculators. © Joerg Woerner, July 14, 2009. No reprints without written permission.